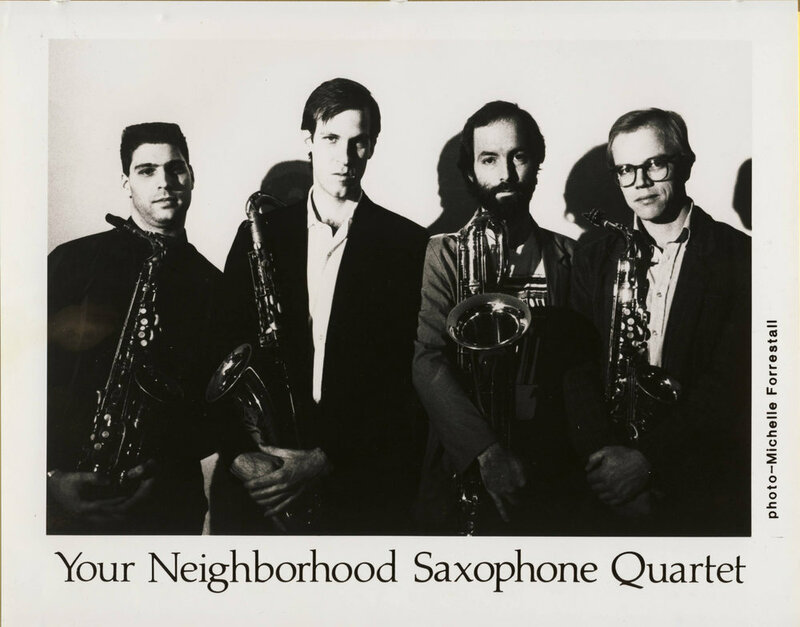 Your Neighborhood Saxophone Quartet’s first LP, YOUR Records 1001, recorded in 1984 and released in 1985. Art and design by Katie Conway. Your Neighborhood Saxophone Quartet is a saxophone quartet based in the Boston area, from 1980 to the present, specializing in improvised music and original compositions by its members. The group recorded one LP on its own label and five CDs for the Coppens label (Amsterdam), and made nine trips to Europe to perform at clubs, concerts, and festivals, one midwestern US tour, and many appearances around New England and in New York City. YNSQ was formed in May 1980 by Steve Adams, Cercie Miller, Tom Hall, and Danny Bittker. Tom and Cercie knew one another as fellow jazz students New England Conservatory. Combinations of Tom, Cercie, Danny, and other NEC student saxophonists (Mike Moss, Debbie Keefe) had gotten together informally earlier that year to read some published classical saxophone quartet music. Danny knew Steve because they both studied Indian music with Steve Gorn, and Steve and Cercie had met through playing with folk singer-songwriters Geoff Bartley and Patty Larkin respectively. Cercie and Steve saw the Cambridge Saxophone Quartet at the River Festival and decided to do some quartet playing. Tom, Cercie, Danny, and Steve did a first rehearsal, reading some of the classical pieces, then following up with a free improvisation, which inspired them to start composing and arranging for the group themselves. They began rehearsing, playing their compositions and arrangements and working on free improvisation concepts and structures. L to R: Tom Hall, Steve Adams, Cercie Miller, Allan Chase, near Gallery East, Boston, 1982. The group played around New England at self-produced concerts (often at First Congregational Church in Harvard Square), and at Studio Red Top, Gallery East, the Cambridge River Festival, the Iron Horse (Northampton, MA, where Amy Denio booked the bands), the Common Ground (Brattleboro, VT), outdoors in Harvard Square, Emmanuel Church concerts, Ryles, Jonathan Swift's (opening for Old and New Dreams and the Airto/Flora Purim/Joe Farrell band), Eric (New York), The Dive (New York), various colleges (Berklee, Salem State, Brandeis), Ran Blake’s 50th birthday concert at NEC’s Jordan Hall, a house concert in Brookline (The Longwood Living Room Series, hosted by Joe Mulholland), the international terminal at Logan Airport, a wedding reception, a Zen Sword school in Brighton (with George Garzone), and cable TV and radio shows. They premiered compositions by Robert Aldridge, Chris Stowens, and Thomas Oboe Lee in several Composers in Red Sneakers concerts, sometimes with guests including George Garzone (tenor sax and spoken word on Aldridge’s saxophone quintet “How Many Spoke to Make the Wheel?”) and Greg Badolato. YNSQ stickers and t-shirts were produced to help publicize the group. The quartet rehearsed twice a week, usually in Cercie’s Jamaica Plain basement, and performed very frequently around New England during this period. Rehearsals consisted of readings and practice of members' new compositions, and exercises in structured improvisation. Manager David Gessner, who had worked with Cercie in the folk and rock scenes around Boston and Cambridge, began to do some work for the band, helping with club bookings through 1986. On one occasion, the well-known ROVA saxophone quartet from Berkeley and San Francisco was in town to perform at the New Art Center in Newton, MA, and the two quartets did an octet improvisation session in Cercie’s basement. 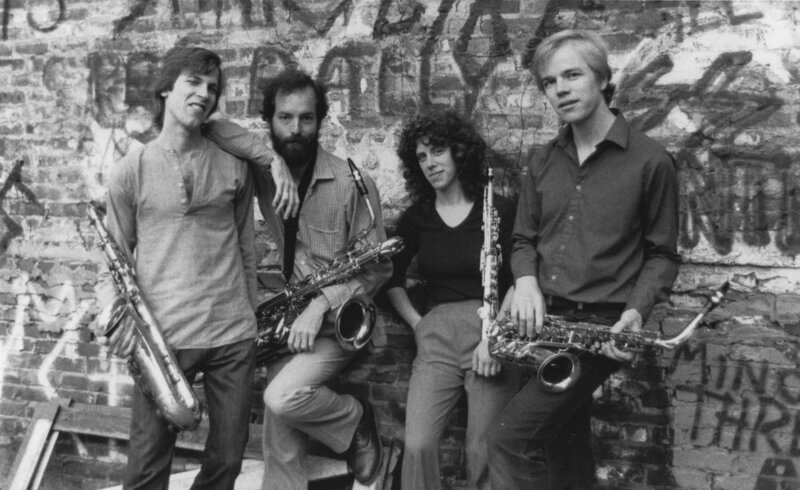 Cercie left to devote more time to Girls' Night Out, a successful all-women rock and oldies band, in October 1984 after finishing YNSQ’s self-produced first LP, Your Neighborhood Saxophone Quartet (Your Records 1001). Ben Schachter, who had been in an advanced ensemble Allan taught at Berklee two years earlier, joined the quartet. Shortly after Ben joined, George Coppens of Osmosis Records/Coppens CDs in Amsterdam contacted Ben about YNSQ after hearing the debut LP via his music librarian friend at the Amsterdam public library. Coppens was a publisher of experimental novels translated into Dutch, and also a sometime jazz promoter with interests in avant-garde jazz (he had booked tours by Sunny Murray and David Murray), saxophone ensembles (he booked an early tour by the World Saxophone Quartet, and produced several LPs, CDs, and tours for The Microscopic Septet and the 29th Street Saxophone Quartet on his Osmosis label), and the music of Lennie Tristano and his students. Ben couldn't go on YNSQ’s first European tour due to his new teaching job at Berklee, so Bob Zung (also a Berklee faculty member, but one who could get away) went as a sub and is on the first CD, The Walkman (Coppens CCD 3001), which was recorded live on the tour. Manager David Gessner traveled with the group on this first European tour in October 1986. YNSQ live in Groningen, Netherlands on our first European tour, fall 1986. L to R: Steve Adams, Tom Hall, Bob Zung, Allan Chase. Ben was with the group through our next two trips to Europe in June 1987 (Moers Festival, Köln TV “Aktuelle Stunde” show, etc.) and December 1987, and is on half of the second CD, What's Gone (Coppens CCD 3002). Ben left the group in April 1988 shortly before moving to the Philadelphia area, and Bob Zung rejoined the group beginning with the May 1988 tour, during which the quartet recorded the remaining half of What's Gone. L to R: Ben Schachter, Tom Hall, Steve Adams, Allan Chase, 1987. Steve first subbed with ROVA, replacing founding member Andrew Voigt, in Fall 1988 and moved to Berkeley to join them in February 1989, but did the May 1989 tour with YNSQ. Boogie Stop Shuffle was recorded on that tour. Steve was replaced permanently by Joel Springer as of November 1989. Joel joined on tenor and Tom switched to baritone, which he had occasionally played in the early years of the quartet. YNSQ (now Hall, Chase, Zung, and Springer) played at the Swingin' Groningen festival in September 1990 and did a two-week tour of Holland, Austria and France in October 1990, where they recorded for the group’s fourth CD for Coppens, Plutonian Nights, featuring the group’s arrangements of compositions by Sun Ra. The remaining tracks were recorded in February 1991 at the Blacksmith House in Cambridge, Massachusetts. On tour in Salzburg, Austria. L to R: Tom Hall, Allan Chase, Bob Zung, Joel Springer. Bob Zung left the group in August 1991, when he moved to Japan (although he returned for one gig in January 1992 at the Iron Horse). YNSQ played at the Knitting Factory in September 1991 with Thomas Chapin replacing Zung, but for the Spring 1992 tour, Ben Schachter returned to the group. The tour of Holland (the group’s eighth trip to Europe) took place in February and March 1992. YNSQ recorded one night at the BIM-Huis for a planned sixth album (and fifth Coppens CD). Steve Adams (who had just finished a ROVA tour of the East Coast, which, coincidentally, also included Danny Bittker subbing for the ailing Larry Ochs) did two nights as a guest on alto with the YNSQ at the Café No in Portland, Maine, in April 1992. (During the same weekend, ROVA played at the Café No with YNSQ founder Danny Bittker still subbing for Larry Ochs, Allan Chase sitting in on one piece, and, of course, Steve Adams — YNSQ alumni outnumbered original ROVA members that evening.) Schachter performed with YNSQ at the May 1992 Bang on a Can Festival in New York and at the June 1992 Mellon PSFS Jazz Festival at the Painted Bride in Philadelphia. Schachter, still living near Philadelphia, was not available to fill the alto chair full-time, so auditions were planned for late July 1992. Douglas Yates was selected to fill the alto chair, and began rehearsing with the quartet in the fall of 1992. The group worked at the Middle East, the Creative Music Café (Under Nightstage), the Blacksmith House, CAV (Providence), and the Café No in late '92 and '93. YNSQ recorded their fifth CD, Wolftone (Coppens 3007), on June 10 (live at the Blacksmith House) and October 31, 1993 (The Music Room, Cambridge—the group’s first studio recordings to be released since 1984). 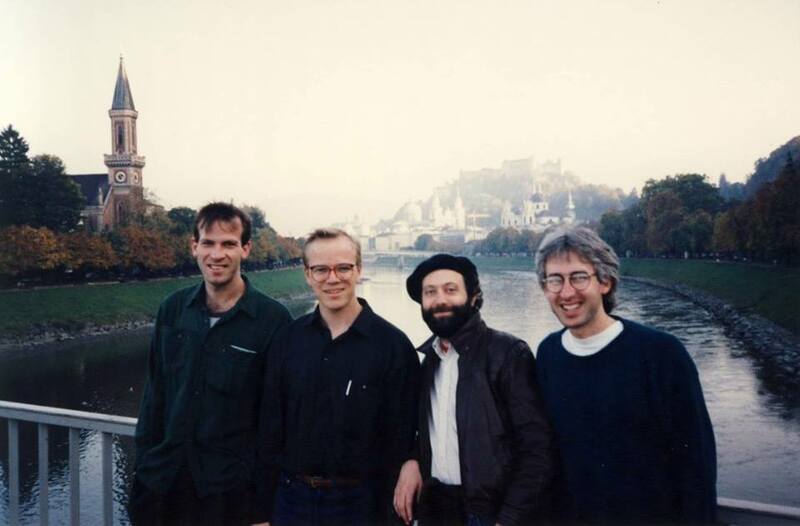 L to R: Allan Chase, Joel Springer, Tom Hall, Douglas Yates, 1991-2. On March 3, 1994 the group performed at New York's Merkin Hall as part of the New Sounds Live series. The concert was broadcast to NPR stations throughout the United States. Segments of the concert were used as filler music on NPR's "All Things Considered" in the summer of 1994. In August 1994, the group made its first midwestern U.S. tour, playing concerts and clubs in Detroit; Chicago (at the famous Green Mill jazz club); Joel’s hometown of Bloomington , Indiana; Toledo (Rusty’s Jazz Café); and Cleveland. YNSQ's ninth trip to Europe took place the last week of October 1994. The group only played as a quartet a few times from 1996, when Douglas Yates moved to New York City just as Allan Chase was moving back to the Boston area, to 2007. As of 2019, YNSQ hasn’t recorded since Wolftone (1993). They reunited in 1999 for a Wellesley College alumni week gig, playing the music of Sun Ra while guests looked through telescopes. Some of the members played in smaller combinations during this period. Tom and Allan made a duo recording (unreleased) in Spring 1997, and Tom, Joel and Allan played four free improvisation gigs: three at the Zeitgeist Gallery in Cambridge in 1999-2001, and one at the Artists-at-Large Gallery in Hyde Park on February 10, 2006. They played as a trio and quartet (with Jeremy Udden on alto) at New England Conservatory’s Jordan Hall in concerts of the music of Burt Bacharach and Brian Wilson in 2001 and 2002, playing Allan’s arrangements of “In Between the Heartaches” and “Til I Die.” On April 21, 2007, Tom, Cercie, Allan and Joel performed as YNSQ, bringing together some of the first and later personnel in the group, in JazzBoston’s Boston Jazz Week kick-off concert at the Berklee Performance Center, at the invitation of concert organizer Mark Harvey, who had booked the group 25 years earlier at Emmanuel Church. Since then, the quartet of Tom Hall, Cercie Miller, Allan Chase, and Joel Springer has performed at NEC’s Brown Hall in a tribute to John Coltrane (September 17, 2007), and at the Lily Pad performance space in Cambridge (2009, ‘10, '14, ‘18). On April 8th, 2011, the group celebrated 31 years of music with a reunion concert featuring founding members Steve Adams and Danny Bittker plus the current members (Hall, Miller, Chase, Springer) in a program of old and new music at First Congregational Church in Harvard Square, where many of the early and mid-1980s concerts were held. Two nights later, on April 10, 2011, Steve Adams and the current YNSQ members performed at The Stone in New York’s East Village with former member Douglas Yates sitting in. YNSQ Reunion Concert rehearsal, for our concert at First Congregational Church, Cambridge MA, 4.10.11. L to R: Danny Bittker, Joel Springer, Cercie Miller, Steve Adams, Tom Hall, Allan Chase. Douglas Yates joined us the next night at The Stone in New York City. YNSQ has played occasionally but infrequently since 2011, including celebrations of Sun Ra's centennial on May 21, 2014, and an all-improvised performance on April 3, 2018, both at the Lily Pad.